Some thoughts on how the perfectionistic art of a delicate craftsman, can speak to the need for expression, imagination and transformation, and how these can be useful for a political ecologist. A course on social movements and activism organised for Entitle fellows brought me to Rome the same days that the Chiostro del Bramante was exhibiting the work of the Dutch artist Maurits C. Escher (1898-1972). Escher himself had spent many of his summers in the Italian countryside and in Rome, where he was inspired from the geometry and simplicity of the Mediterranean landscape and its exquisitely detailed flora and fauna. 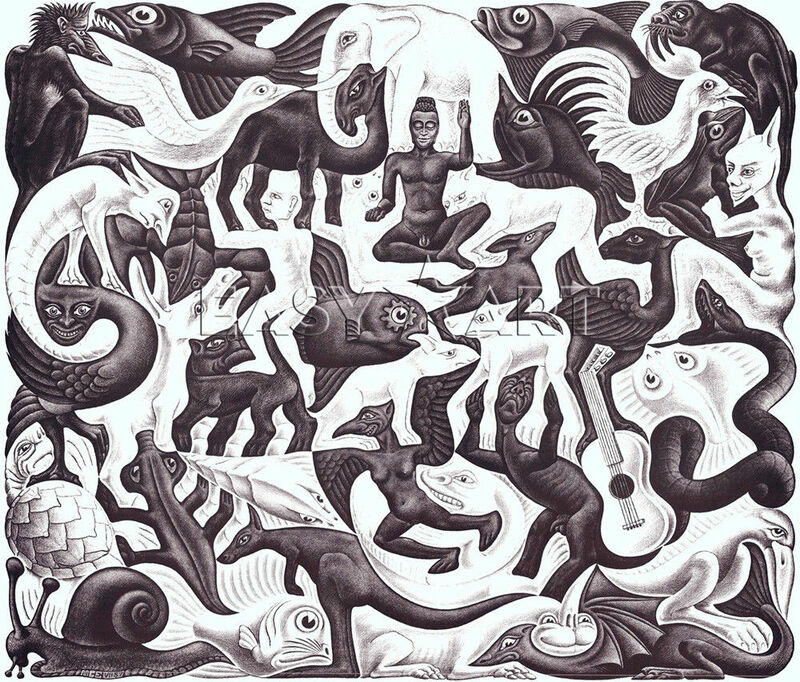 Escher, the “mathemagician”, was a muralist, a tapestry designer and an illustrator. But most of all, he carved wood and stone creating his famous, technically intricate, and visually intriguing prints. Playing with techniques such as Anamorphosis and Impossible Objects, Escher gets into our minds, making us question our own senses and thus, our cognition and perception. Our vision is biologically defined and conditioned. However fine-tuned our cornea, iris and optical nerves, our eyes cannot always see the whole picture. They are “designed” to detect certain shapes first, while others only after some time of focused observation. 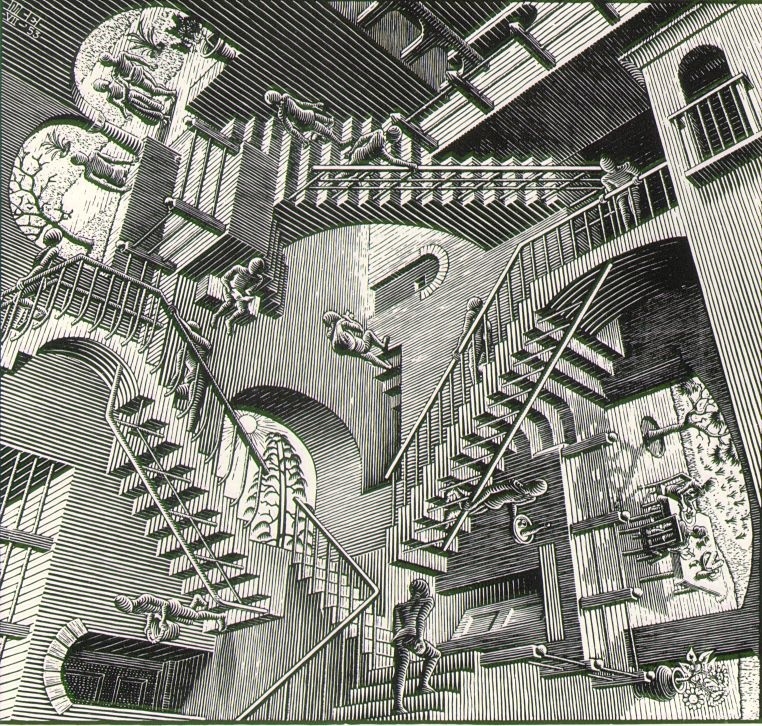 I paid attention to the way Escher uses repetition and geometry to experiment with our eye’s tendency to “act” based on familiarity, easiness and normality. Based on what we perceive, we first think we see one thing, but then we think we see another. It takes effort to realise that both things are there, depending on how you choose to look at them. Looking at the “impossible cube”, at first sight we see the cube being in front of the man’s hands. 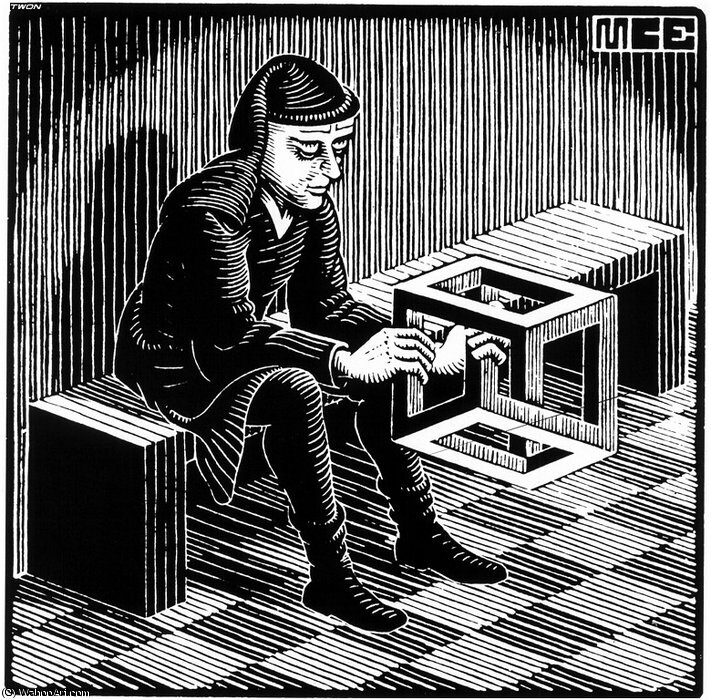 Looking twice, we realise our perception was playing the easy way, and in fact, one of the man’s hands is (also) inside the cube. The time I allowed myself to reflect on Escher’s drawings paid back with a small revelation, an awareness of a new thought: How many times have we not recognised the limits of “black or white” logics in our everyday interactions, as well as in prominent discourses worldwide? How many ethical, moral, political, spiritual and scientific binary divisions have we not created or followed, without taking the time to look closer and think deeper? Jumping from the natural sciences to the humanities, I can say for certain that it takes effort to question knowledge that you always took for granted. Looking at disease through medical books and laboratories, we can only “see” microbes multiplying and jumping from one person to another, to water, to objects, to food. Opening our “eyes” to how disease is understood and experienced, we see that disease is also social class, political decisions, shame and stigma. Seeing one doesn’t have to exclude the other. One of the things I struggled with, during the beginning of my fieldwork on diarrheal disease, was -unconsciously- trying to understand traditional Vietnamese medicine through a biomedical rational framework. After months I started realising the immense richness and value of a field that I was simply not trained to recognise and which, in cultural terms, perhaps I never will completely understand. I saw how ingrained traditional bodily and health perceptions were to the identity of the Vietnamese people. It is no wonder that questioning or diminishing such perceptions in order to make way for successful biomedical solutions – like much of public health discourse does – was bound to fail in the popular consciousness. How can perceptual frameworks co-exist and complement each other, promoting meaning and motivating action, without excluding each other? How can local cultures deal with global trends of capital and modernisation, without being subsumed or excluded? Escher’s “Mosaik II” is a beautiful visualisation of this idea. It is indeed a valuable achievement to realise that our perceptual and cognitive eyes are conditioned (maybe not biologically, but indeed socially and culturally) to see according to easy divisions. Accepting such -familiar- structures as the one reality, we forget that we can always question them. It takes effort to look closer and identify what else can be seen; to grasp how other shapes can be created with and through the same lines. We pose our own limits, but playing with those limits is our task. It is not only about using whatever floating ideas of black and white exist already, compromising with different shades of a resulting grey. For doing only so, we run the risk of being stuck with structures that can no longer fit our imagination. After seven days of interaction with fellow political ecologists, it would be impossible not to project thoughts about perceptual tension and social construction in the works exhibited in Chiostro del Bramante. I see parallels between the disciplinary tensions, for example, of how natural or constructed reality is, and Escher’s visual games with our perception. He uses tensions of shape and contrasts of light, to create harmonious continuity and flow. From cubic shapes to curbs, to life and life’s own metamorphosis. How can we, as political ecologists, play with tensions of material and discursive truths? In the book “Liberation Ecologies”, Arturo Escobar, a core advocate of post-structural thought in Political Ecology, urges us to recognise that “there is no materialist analysis that is not at the same time a discursive analysis”. Earlier in the same book, the editors refer to Antonio Gramsci and his contribution to Marxist thought, pointing that “transformative human actions do not result automatically from material contradictions; they are mediated by subjective meanings and conscious intentions”. Using the concept of hegemony, Gramsci underlines the dynamic connection and co-existence of material and symbolic; of economy and culture. 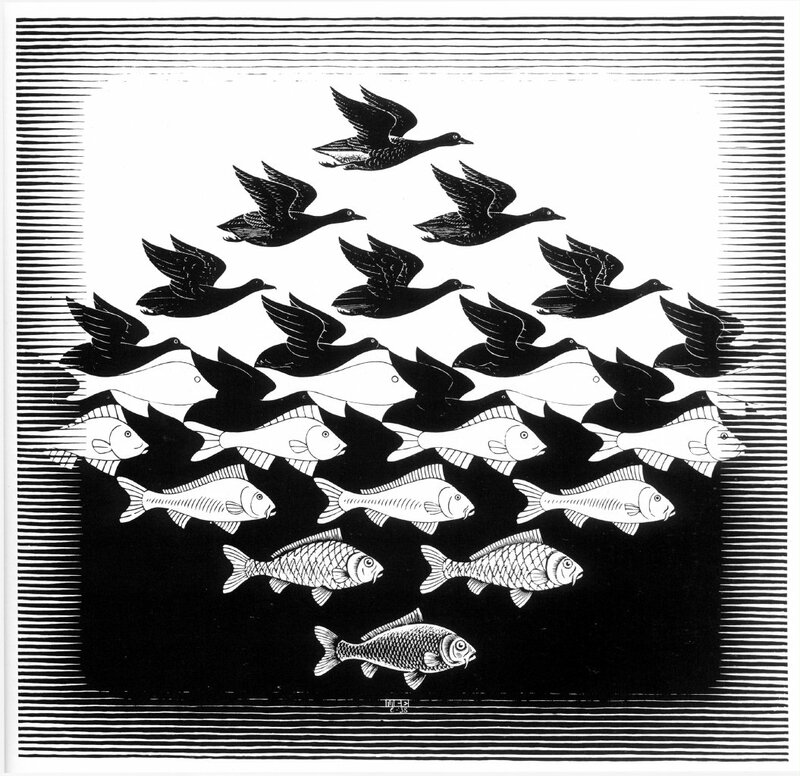 Similar to Escher, he uses this “tension” constructively, forming thought that promotes social transformation. On a more personal note, I have always been afraid of being too adapted, too influenced, too fitting to what is around me and somehow losing the essence of whom I grew up to be. Some beliefs, some ideas about ways of being, we often feel form part of our essential self. We hesitate to open up to what is new and different, in fear of losing what we so much attach to. Observing Escher’s recurrent tendency of using the form of one, to form another, fills me up with hope. In some obscene corner of my mind, I relate this to the ability of changing without losing ourselves. Coming to think of it, every change is always based on the elements of ourselves already present, building on those elements to form something different. It has always been an exciting process where in retrospect one realises which of those elements are the essential ones; the ones that can never be left behind. It is being open to transformation and change that shows you who you really want to be. Escher had once said that he felt constrained by gravity; the walls of the rooms were to him incredibly boring. Using his art he created illusions; impossible worlds and impossible shapes. Water running upwards, stairs which one cannot define if they are leading up or down, spaces seen from three different angles at the same time. Illusions, which even though I soon discover, I immediately and willingly trick myself again and again; playing with my perception. Seeing things that are “impossible” is always fun. Reality is always relative anyway. I am now sitting on a plane seat, being served my cup of tea. I overhear a flight attendant who, after being complemented on his “nice Christmas touch” of a Santa Claus hat by another passenger, bluntly replies: “It wasn’t my choice, as nothing ever is in this company”. It makes me think of Escher, and his need for freedom, for interest, for breaking boredom, for taking it into his own hands to make something beautiful and inspiring through a technique so finely practiced. I can’t help but think that Escher is an art activist, putting in practice his need for broader spaces of existence. While he never claimed to be symbolising anything through the images that he created, I find his work has a special ability to produce meaning, at the same time leaving inexplicable but unforgettable visual impressions. If you want to know more about Escher, visit this website dedicated to his work.